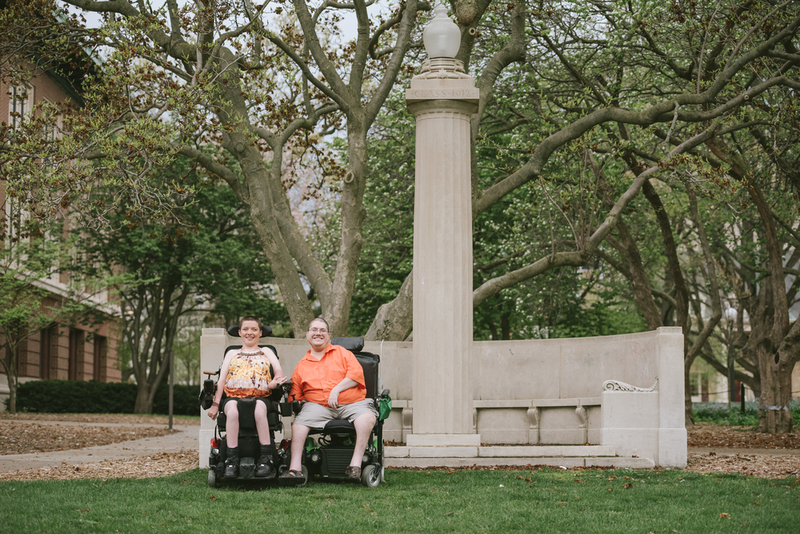 I had the opportunity to return to my Alma Mater, the University of Illinois at Urbana-Champaign, for the first time in a few years (scary how after this long, I return back to campus and immediately feel like I'm 20 years old again) to shoot some portraits of my friend Mer and her boyfriend Jordan. I met Mer at the beginning of my senior year. She was a freshman from New Jersey, and I was the all-knowing senior that she hired to be one of her PA's (personal aide) for the school year. Mer has quadriplegic spastic cerebral palsy, but has never let her diagnosis define her. Her love for life and being active is so inspiring-- she helps manage the UIUC Wheelchair basketball teams, is a competitive downhill skier, and is studying to get her degree in sports management-- and I am so fortunate to have become friends with her during my last year in Champaign. When I got to campus, it rained (down poured) the entire day, and for a moment I thought I had made a 150 mile drive to get rained out. Fortunately, the weather held out long enough for us to get the session in! We laughed, got photo-bombed by the most beautiful golden doodle named Charlie, and then got poured on. Special thanks to Jillian, one of Mer's current PAs/personal trainer, for coming and helping out. We had a great time, rain and all.